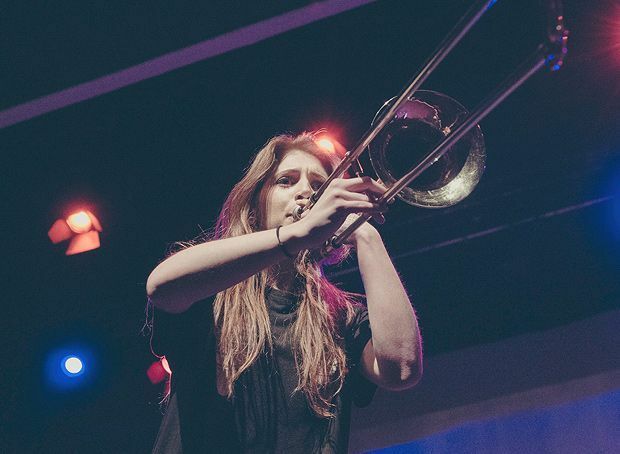 Dipping her toe into Edinburgh's waters after taking advice given to her by the dole office guy about not giving up on your dreams, Faye Treacy is doing a short but sweet 30 minutes of idiosyncratic trombone comedy. Having taken up the classical instrument and joining a youth orchestra (the only way to rebel against a punk-lovin' dad), Treacy went on to attend the BRIT School at the same time as Adele and Jesse J. Though this very early preview is beset with techy problems, Treacy’s charm and endearing performance soon wins us round. She's naturally wide-eyed with a perpetually worried look which she brandishes to her advantage as she lists her concerns (with musical accompaniment, of course). But she needn't fret too much as her one-liners are expertly crafted and sharp. The simple analogy of comparing a trombone to a baby throws up some nicely daft and slightly risqué gags, though there's a slight over-reliance on the easy double entendre on blowing. But this is a promising start, and the popular classical piece played with the aid of a vegetable makes for a delightfully ludicrous and surreal finale that deserves to be seen. Laughing Horse @ Espionage, 477 7007, until 30 Aug, 1.15pm, free.